Popular Festival of Chichester soloist Harriet Mackenzie returns to Chichester directing her Celoniatus Ensemble in a programme featuring Vivaldi’s Baroque masterpiece ‘The Four Seasons’ juxtaposed with the heat of Argentinian tango in Piazzolla’s ‘Four Seasons of Buenos Aires’ and an evocative orchestral work by Canadian composer Emily Doolittle, depicting a blackbird singing in the rain. 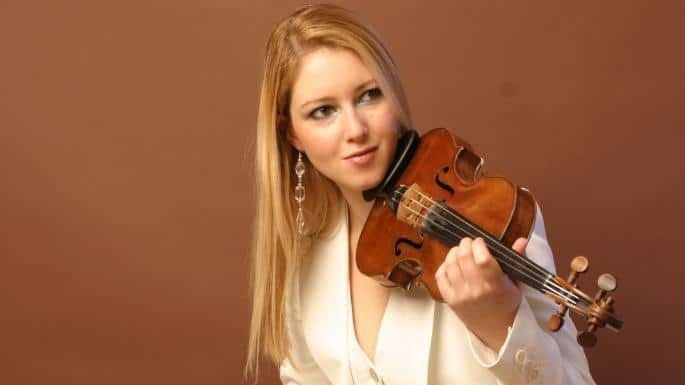 An internationally renowned concerto soloist, Harriet has performed across five continents with regular live broadcasts on BBC Radio 3, Classic FM and Hungarian National Radio. She has released recordings as a soloist and chamber musician on the NMC, Discovery, Naxos, Nimbus and Dutton labels with the Royal Philharmonic Orchestra, Orchestra Nova and the English Symphony Orchestra receiving international acclaim, including nomination for the ‘Recording of the Year’ in the Music Web International: “There is completeness, a confidence, an honesty and a consistent lyrical beauty that has moved me again and again. These qualities all emerge in Harriet Mackenzie’s utterly magisterial performance.” – Richard Hanlon. Hand-picked and directed by Harriet, this highly acclaimed string ensemble is named after Harriet’s rare and beautiful 1730 Italian violin. It is a virtuoso group of some of today’s most brilliant young players who formed at Trinity College of Music – one of London’s leading music conservatoires. Harriet’s playing and directing has been described as with “searing intensity….a performance full of panache…captivating” (The Strad). This Festival of Chichester event is presented by the dynamic Chichester-based Amici Concerts. Note to ticket buyers: this concert will be being filmed professionally.